Take advantage of our specials. Visit our coupons page for further details. We are a full service building repair & restoration company.We offer FREE estimates, inspections and advice. We have an A+ rating as a BBB member, as well as being Angie’s List recommended. Chimneys to foundations and everything in between. High profile historical restoration jobs, as well as tuckpointing the chimney of a small home. Artison masons who love their work and take great pride in every project. The owner of this family business is personally involved with every job no matter the size! Top•Hat Masonry & Chimney, LLC has been serving Greater MILWAUKEE AREA with quality Masonry & Chimney services for over 20 years, and is fully Licensed, Bonded and Insured for your protection. 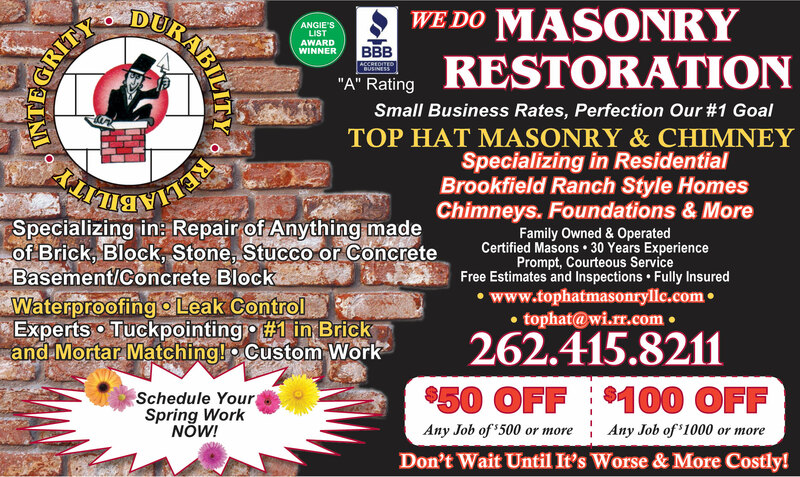 Top•Hat Masonry & Chimney, LLC has over 30 years of experience so there isn’t much we can’t repair. We love helping our customers and provide the very best of service. We have an A+ rating as a BBB member, as well as being Angie’s List recommended. Chimney repair to foundation repair and everything in between. High safety standards have always been a part of Top Hat Masonry & Chimney LLC. They allow us to make sure that both our work crews and customers are safe and protected. In turn, this ensures that the job is done accurately and safely. Integrity & attention to detail guarantee our customers will be pleased with the outcome, and are aware of each step of the process.